The company that is today Vaughan & Bushnell Mfg. 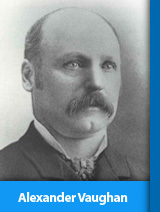 Co., was founded in Peoria, Illinois by Alexander Vaughan. It began as a plumbing business, which in those days consisted of digging wells and piping water into the kitchens of the local citizenry. Alexander's business prospered, but the inventive, 18-year old blacksmith had his eye on bigger things. The split-rail fencing of farmland was beginning to be replaced by steel posts and wire. Alexander had an idea for improving the design of the augers used for digging post holes. He turned idea into reality, and believing that Chicago would outstrip Peoria as a business center, moved to the Windy City. He set up a blacksmith shop in a room behind a hardware store owned by Sidney Bushnell. On June 15, 1869, Alexander was granted U.S. Patent No. 91,387 for his Improved Post Auger. Customer satisfaction with Vaughan post augers led to requests for other hand tools, and Alexander soon found himself in the custom tool business. There were several Vaughan salesmen traveling the Mississippi and Missouri River valleys selling augers and other tools when tragedy struck in the form of the Great Chicago Fire of 1871. The fire destroyed the fledgling Vaughan Company. In its aftermath the strained finances of the company forced Alexander to seek additional capital. Sidney Bushnell offered to furnish the needed funds. The company was incorporated in 1882 as the Vaughan & Bushnell Mfg. Co.
By this time Vaughan's product line had grown to include quite a variety of tools and implements. One of the first Vaughan hammers, a so-called killing hammer, was in great demand for delivering the coup de grace to cattle being processed at the Chicago Union Stock Yards. Besides hammers, tool such as those needed for blacksmithing and shoemaking were also being manufactured, together with chisels, punches, pincers, nippers, star drills, planes, wrecking bars and pliers. Sanford S. Vaughan, Alexander's only son, joined the company in 1886, just before a move to larger facilities.As time passed, obsolete items were dropped from the line. More hammers, and a variety of hatchets and axes, were added. The great demand for hammers, hatchets, axes and wrecking bars soon made them the primary items in the line. Vaughan eventually came to specialize in the manufacture of hammers and other striking tools. 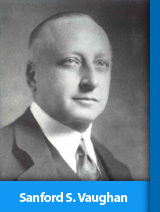 After Alexander's death in 1905, Sanford took over full management of the company. He was an innovator and made many basic changes in the design of the traditional carpenter's hammer, changes which are to be found in all hammers being made today. Handle-to-head wedging was improved, and Vaughan patented the triple-wedge design. In 1918 Vaughan introduced its classic 999 pattern ripping hammer. Sanford served the company for 65 years until his death in 1951. Sanford's son, Howard Sr., joined the company in 1922, the year the interests of the Bushnell family were purchased by the Vaughan family. 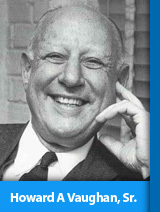 He was named President and Chief Executive Officer in 1945. One of his major concerns was that demand for tools" both those carrying the Vaughan label and those of the many private label brands which Vaughan was by then supplying" would soon outstrip the capacity of the Chicago plant. A chance meeting at a trade show with a garden tool manufacturer headquartered in Bushnell, Illinois, led to Vaughan's move there in 1940. Limited manufacturing commenced in Bushnell in the fall of 1940, and was gradually expanded during World War II. The town's location and ample labor supply proved so favorable that, in 1950, it was decided to consolidate all manufacturing operations in Bushnell. 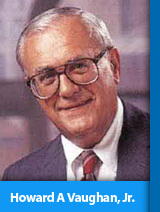 Howard A. Vaughan, Jr. joined the company in 1956, was named Vice President of Sales in 1960 and became President in 1966. Vaughan during that time was a major supplier of striking tools, both under its own name and many other proprietary brands, as well. Taking as his goal a substantial increase in sales of Vaughan-labeled tools, Howard Jr. first ordered a major modernization of Vaughan's manufacturing processes to ensure that adequate production capacity would be available to absorb a market expansion. Vaughan's insistence on consistently high quality was recognized when, in 1993, the company became the first striking tool manufacturer in the world to be awarded the International Standards Organization ISO 9002 Certification.In 1963 the administrative headquarters of the company were established in Hebron, Illinois. A subsidiary, The V&B Mfg. Co., was formed in 1966, and a plant built for the manufacture of hickory handles. Located in Walnut Ridge, Arkansas, V&B Mfg. ensured availability of top quality handles. In 1992, GroundBreakersÂ® landscaping tools were added to the product line. Innovative in design and construction, they quickly found wide acceptance among landscapers, contractors and home gardeners. Vaughan in 1994 acquired a sawmill in Centerville, Tennessee. This facility, situated in the heart of a hickory forest, guarantees Vaughan a virtually unlimited supply of the highest quality hickory for both striking tools and GroundBreakers landscaping tools. [Hebron, IL, May 15, 2018] Vaughan & Bushnell Manufacturing Co. (aka “Vaughan”), a world leader in the production and sale of hand tools, including hammers and prybars, is pleased to announce today that it has acquired substantially all the assets of Dasco Pro, Inc. (“Dasco”), an industry leader in the production of chisels and punches. “We are extremely excited about our acquisition of Dasco and combining these two great, venerable American companies” says Charlie Vaughan, company President. “This acquisition will expand our product offering within the same growing retail category, generate further economies of scale for our ‘Made in the USA’ manufacturing, and strengthen our competitive advantage against other tool manufacturers, both domestic and foreign”. Today's Vaughan & Bushnell is of a size and sophistication that Alexander Vaughan could scarcely have imagined. While new manufacturing techniques and processes have played a part, the people of Vaughan are the true foundation of the company's success. Dedicated to the goal of producing the finest striking tools in the world, they have helped transform Vaughan from a small maker of hand tools to one of the world's largest manufacturer of striking tools. Vaughan tools are made with an attention to detail that is exceptional. Five generations of the Vaughan family and the dedicated craftsmen who produce their products care a great deal about the tools that carry the Vaughan name, and the care is obvious.